“The village” was called upon to help us. 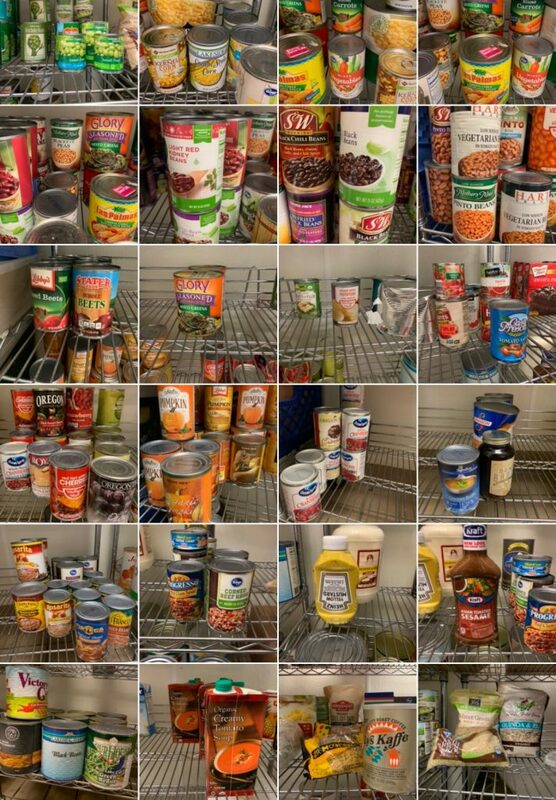 During the week, our pantry was replenished with much needed cereal, peanut butter and jelly from members of California Heights United Methodist Church. Yesterday, we received more pantry food donations from Raul and others. Thank you, Ann Lampe for representing UCO at Neighborhood Church in Palos Verdes’ service yesterday, as we have been chosen as one of two recipients of their Easter offerings. Thank you to chef Melody and her team of volunteers who made fried rice, teriyaki chicken, vegetables and salads. Thank you to Deb Moore, Gayle Taggart and others who helped us transport food and supplies from First Congregational Church to Beacon. Quick action was required when we arrived an hour before opening and learned that more than half the tables and chairs we normally used were not at Beacon. Volunteer of the Week Adrian Phillips saved us by recalling that there was a tiny party supply store a half mile away. Adrian drove his classic pickup truck to the store and we loaded up his flatbed with tables and chairs and were back at Beacon in a flash. 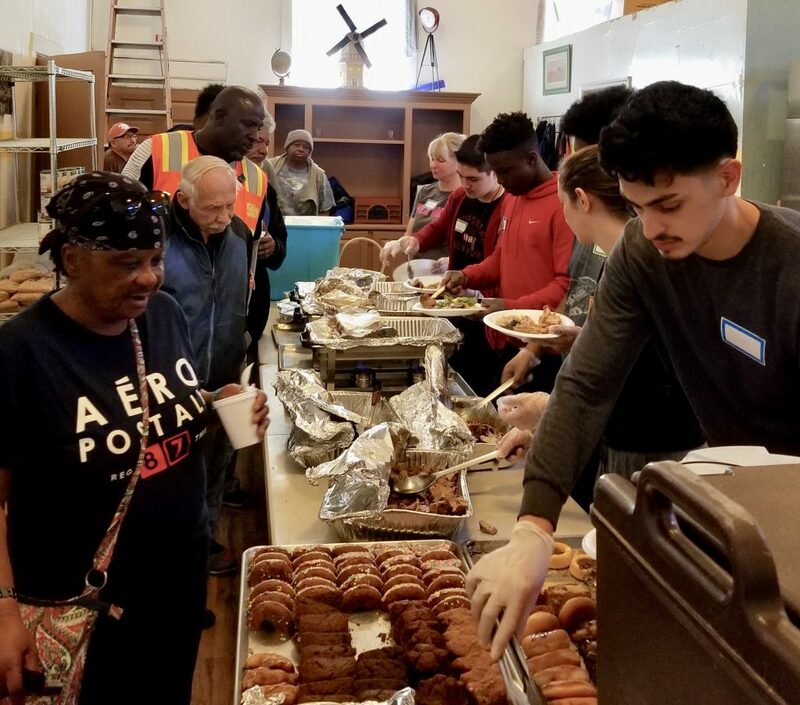 With the help of our volunteers from Long Beach State and one from St. Anthony’s High School, we opened on time and served 112 guests, of whom 17 were new at the Drop-In Center. Thank you to nurse Anne, her assistant nurse Anna and other nursing volunteers who were on-hand at Beacon. 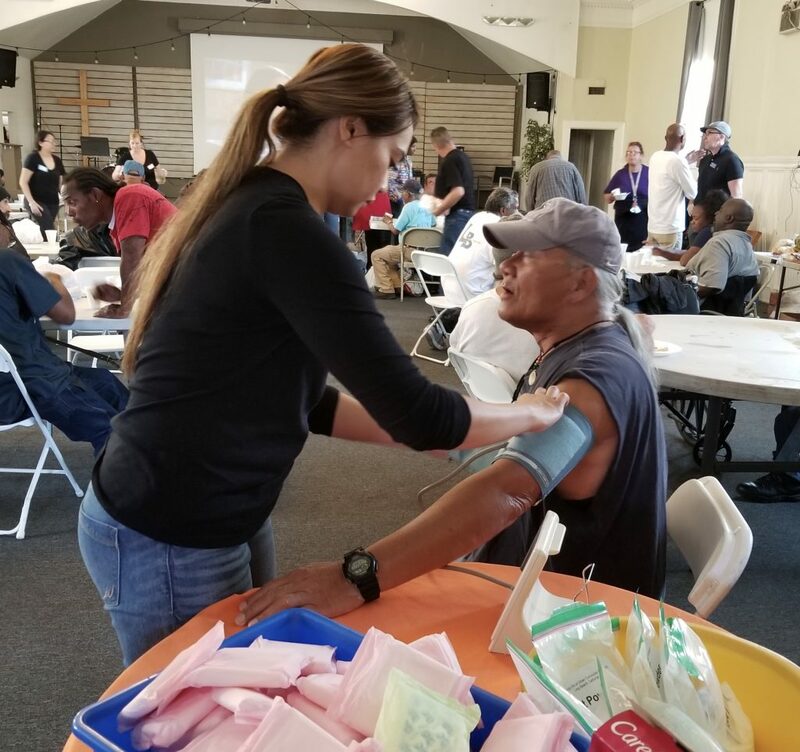 Our outstanding volunteer nurses helped guests with feet conditions and other health maladies, checked blood pressures and gave away first aid, toiletries and over the counter remedies. Bread, fruit and other rescued groceries from Trader Joe’s that were delivered that morning from Food Finders were given to our guests to take with them. We helped several clients with transportation passes. We also used Long Beach Community Foundation’s donation to help a gentleman with his rent for April – he works full-time but had his recent wages mistakenly garnished twice for child support. Please consider attending our upcoming BBQ dinner benefit on April 27th when we will honor Temple Israel and Brenda Caloca of Supervisor Janice Hahn’s office. There will be live entertainment by local band Second Wind, as well as a silent auction. Anyone who has items to donate for the silent auction should contact our event chair Cheryl Doorbar at cdoorbar@gmail.com. To RSVP or donate, please visit our website www.ucodic.org.